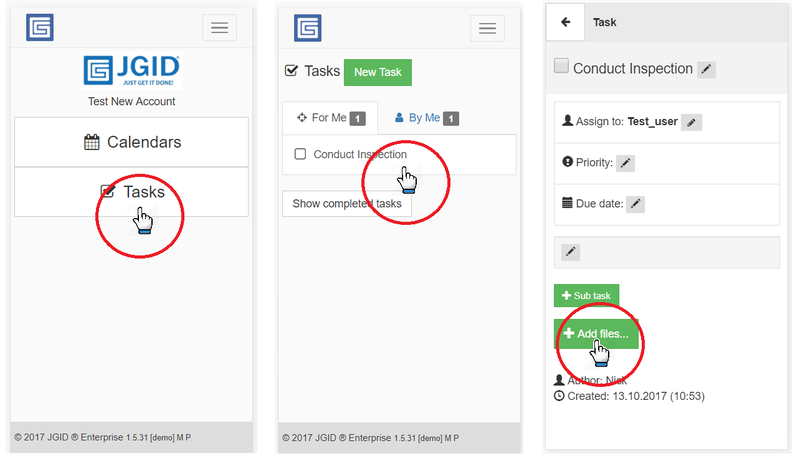 Question: During training I was taught that our Employees can use the Field Notes button of their Mobile JGID accounts to attach images related to the Job’s progress. However I need to send a person onsite to take images which our estimators will use when calculating the Qutoe’s total. How do I get the guys to attach images to the project at Opportunity stage, given they don’t have access to the Field Notes button at this time? Answer: The solution to this situation is to create a Task within the Opportunity and assign it to the person who is going to conduct the inspection on-site. Thus the Employee will be able to Add Files to the comment section of the Task and will be able to take images with the camera of the smartphone and upload them quickly to share with the team at the office. Plus the Task notes and the images attached to them would remain linked to the project in all of its stages!